Born in 1948, Tsuyoshi Yamamoto began playing while he was in a grade school. He caught the jazz bug when he saw Art Blakey and the Jazz Messengers while in high school and taught himself how to play jazz piano. He turned professional in 1969 at the age of 19, while still attending college. His debut album Midnight Sugar was issued by the Three Blind Mice label in 1974. 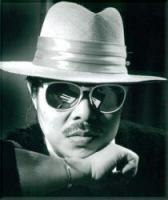 His swinging piano style full of blues feeling caught the attention of jazz fans, and his follow-up album Misty became a huge international hit, establishing him as one of the most popular jazz pianists in Japan. After playing at the Monterey Jazz Festival in the US and Montreux Jazz Festival in Switzerland, he spent a year in New York. He has played with Dizzy Gillespie, Carmen McRae, Sam Jones, Billy Higgins, Elvin Jones, Sonny Stitt, Steve Gadd and Eddie Gomez, among others.